Scribner Book Company, 9781416541301, 328pp. A magnificent tale of death and destiny, past and present, in an Ireland rich with tradition, myth, and mystery: "Lake of Sorrows has a heft and richness uncommon in contemporary suspense novels" (Minneapolis Star-Tribune). American pathologist Nora Gavin has come to the Irish midlands to examine a body unearthed at a desolate spot known as the Lake of Sorrows. As with all the artifacts culled from its prehistoric depths, the bog has effectively preserved the dead man's remains--his multiple wounds suggest he was the victim of an ancient pagan sacrifice known as "triple death." But signs of a more recent slaying emerge when a second body, bearing a similar wound pattern, is found--this one sporting a wristwatch. Someone has come to this quagmire to sink their dreadful handiwork--and Nora soon realizes that she is being pulled deeper into the land and all it holds: the secrets to a cache of missing gold, a tumultuous love affair with archaeologist Cormac Maguire, and the dark mysteries and desires of the workers at the site. As they draw closer to the truth, Nora and Cormac must exercise the utmost caution to avoid becoming the next victims of a ruthless killer fixated on the gruesome notion of triple death. 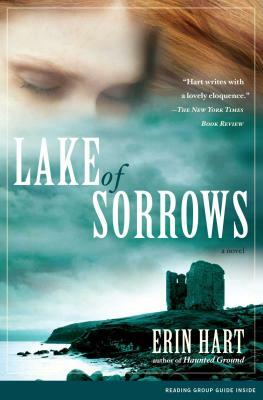 "Personal detail and local history give Lake of Sorrows a heft and richness uncommon in contemporary suspense novels." "Rich and delicious...emotionally and intellectually gorgeous.... Readers...will relish this new adventure." "Hart writes with a lovely eloquence."